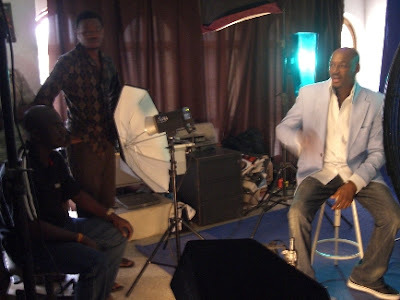 Tuface " I like to take things naturally. Apart from being an artiste, I see myself like anybody else. I just take things naturally. No airs, I'm just myself all the time. On women, they come definitely, but I take it easy". You take it easy and already have two kids from two different women? Tuface, you are a champion! "Up till now, I don't even know. Make we wait, we still dey count". This is supposed to be a joke? "We dey try, we dey wise up these days. You have the opportunity of watching TV and see them sell shares, see people buy houses, we are learning because investment is the in-thing now". Sensible! Did he think he would win? "I just had a dream that one day something great will happen to me, it's been a long way, but I'm really happy it did happen"
"I will say God first. And then hard work, and I had a praying grandmother." "It is to uplift that image. They think Africans do a certain type of music in the whole world, they place Africans on a certain level in music. I think I stand a chance to proove the rest of the world wrong. "First of all, I will rush to the church and pay my tithe. I will make sure I do all in my power, that what we didn't have when I was growing up, we sure will have now". I wish he had won more cash! Was she disappointed when Timi won? "No never! If you watched the top 24, it was Timi and I who scaled through. 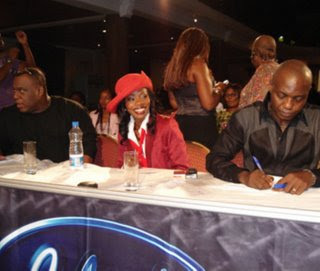 Even during the auditioning in calabar, Timi and I auditioned together. 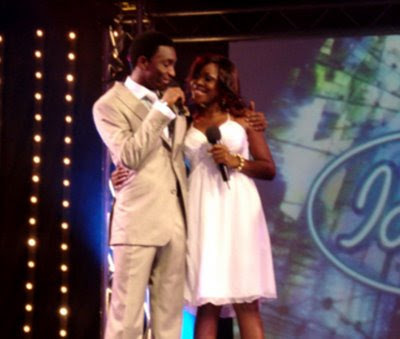 That was where I fell inlove with Timi's humility. Timi is a great person and a brother indeed, he deserved to win"
"My boyfriend cheated on me with my best friend. You watch movies that tell these stories and you imagine they can never happen in real life. When I confronted him, he said it was the devil that made him do it. When I confronted her, she said it was not her fault. So was I to blame" No sister, you just had a cheating boyfriend and nasty girlfriend! "I was the first female Ghanaian to come out with a hip hop album, before that, all the women were singing either gospel or traditional music." OK, I'm surprised at Tuface's elusive answers. Why not come out straight? TuBaba, if you're reading this, make you dey careful o. How 4 girls go get belle for you? Easy o.
I was (and still am) happy Timi won over Omawumi. I'm keeping my reasons to myself. Nana, eh yah, i feel for you o. Boyfriend/best friend, bad combination. I hear she's doing a good job in Ghana Hip Hop. Keep it up. As much as I love tuface's music, I have one word for him, get a rep for your publicity. A mouthpiece to answer your questions. This has to be the most ignorant ish I have ever heard. Abeg leave Tuface alone, Nah today?And stop asking him when he's getting married, how many kids get belle for am etc. Stupid question beget stupid answers so TuBaba, no shaking!!!! i'm glad timi won,but iwill advise him to handle his fame with care,he should not allow the fame to get to his head.And i will give kudos to all the judges and mike for the job well done.